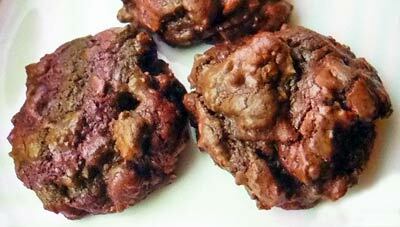 Here's another tried-and-true recipe for Chocolate Chip Pecan Cookies. But take note, this isn't your traditional chocolate chip cookie dough with pecans tossed in. They should really be called Chocolate Chocolate Chip Pecan Cookies! Thanks to Ghirardelli 60% bittersweet chocolate that is melted and added to the mixture and combined with traditional milk chocolate chips. Add in some brown sugar, maybe some espresso powder if it's to your liking, along with some chopped pecans, and you've instantly got yourself a new favorite cookie. But don't take our word for it, take note of the ingredients and baking instructions and whip up your own batch today. We're sure you won't be disappointed - we sure weren't. In the top of a double boiler, or using a heatproof bowl over barely simmering water, melt the bittersweet chocolate pieces, stirring occasionally until smooth. In a large mixing bowl with an electric mixer on medium-high speed, cream the butter, white sugar and brown sugar until light and fluffy. Add the eggs and vanilla and beat on low, scraping down the sides of the bowl with a rubber spatula as needed. In another bowl, sift together the flour, baking powder, baking soda, salt and espresso powder. Add half the dry flour mixture to the butter mixture until well combined. Stir in half the melted chocolate to the butter mixture until well blended. Add in the remaining flour mixture until well mixed. Stir in the remaining chocolate. Stir in the chocolate chips and chopped pecans until evenly distributed. The dough will be soft, so cover the bowl with the dough and refrigerate for about 1 hour. When ready to bake your cookies, position one oven rack in the middle of your oven and preheat the oven to 350F degrees. Line cookie sheets with parchment paper and set aside. Drop the dough by rounded tablespoonsfuls onto prepared cookie sheets at least 2 inches apart. Bake, one sheet at a time, for 15 to 17 minutes. Remove from the oven and immediately slide the parchment paper and cookies onto a wire rack to cool completely. Store cookies in an airtight container. This recipe yields about 48 Chocolate Chip Pecan Cookies. Do you have a website? You can place a link to this page by copying and pasting the code below.